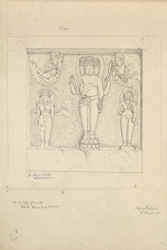 Illustration of Brahma at the end of the veranda (left) and a pillar (right) both from Cave XVII at Ellora from James Burgess' 'Original Drawings [of] Elura Cave Temples Brahmanical and Jaina, IIII.' The spectacular site of Ellora, in Maharashtra, is famous for its series of Buddhist, Hindu and Jain cave temples excavated into the rocky façade of a cliff of basalt. The works were carried out under the patronage of the Kalachuri, the Chalukya and the Rashtrakuta dynasties between the sixth and the ninth centuries. Cave XVII, also known as Chhota (small) Dhumar Lena, is part of the Hindu group of caves and dates to the late 6th century. ?Eight steps rise up to the porch (now also fallen) on the level of the hall, the front of which is supported by four pillars, and the roof inside by eight heavy square ones of various patterns. It has never been finished above, but the drawing shows how it was probably intended to complete it. The front and back aisles are fully 2 feet longer than the middle one, being 64 feet, and the depth of the hall is 37 feet. In the back wall are three doors, two opening into the pradakshina passage which surrounds the shrine, and the central one into the shrine itself, which contains a large square altar and decayed linga. On the rock on the left side of the court, at the end of the façade, is a figure of Brahma with three faces. ?